Getty, Ian A.l.. "Assiniboine". The Canadian Encyclopedia, 16 October 2018, Historica Canada. https://www.thecanadianencyclopedia.ca/en/article/assiniboine. Accessed 25 April 2019. Southern Manitoba, 1874 (photo by G.M. Dawson, courtesy Library and Archives Canada/C-81792). The Assiniboine (also known as Nakoda Oyadebi) are Aboriginal people in Canada whose traditional lands are in the Plains. Around the time of sustained European contact, Assiniboine people were active participants in the buffalo hunt and the fur trade, and controlled vast territories in what are now parts of Manitoba and Saskatchewan. Contemporary Assiniboine communities in Canada are largely located in Saskatchewan, though some mixed communities exist in Alberta. These communities have several reserves, which are often shared with Cree, Saulteaux (Ojibwa) and Nakota peoples, though a large number of Assiniboine people live off reserve. The Assiniboine were first described by Jesuit missionaries as having split from the Yanktonai Sioux (also known as the Nakota) sometime prior to 1640. The Assiniboine are closely related to other Siouan- speaking peoples, like the Dakota, Lakota and Stoney-Nakoda. Linguistically they belong to the Siouan family, speaking a dialect known as Nakota. Though they, at times, lived among the Cree, and shared hunting techniques with the Cree and Blackfoot, the Assiniboine considered themselves culturally distinct. From a homeland around the Mississippi headwaters, they moved northwestwards to the Lake of the Woods and towards Lake Winnipeg. At the peak of their power their territory ranged from the Saskatchewan and Assiniboine River valleys in Canada to the region north of the Milk and Missouri rivers in the United States. Assiniboine culture exhibited most of the classic Plains traits. They were noted for their expertise in constructing buffalo pounds (paddocks used to trap and kill buffalo), and made use of dogs to haul travois loaded with tipi poles, hides and personal possessions as they followed the buffalo herds during the seasonal hunts. Assiniboine people in forests and parklands also hunted big game (deer, elk and moose) and snared small furbearers for food and tanned hides. They also gathered wild vegetables according to location and season, which included picking Saskatoon berries and other fruits to mix with dried meat and bannock. Their most sacred ceremony was the Sun Dance, which was held in early summer after the spring buffalo hunt. 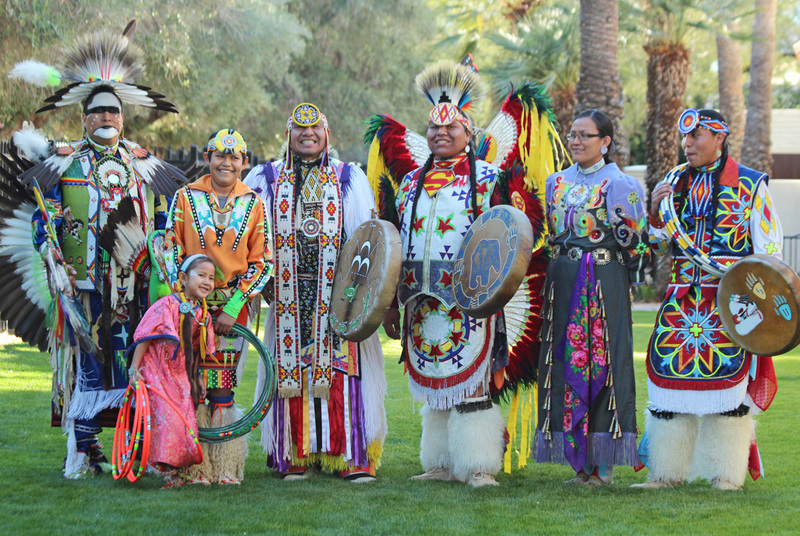 Men and women honoured the Great Spirit through sacred ceremonies involving praying, singing, drumming, dancing and fasting, and concluded with a feast. Young men would go on vision quests to sacred grounds in order to commune with their guardian spirits and practice sacred songs or rituals (see Aboriginal People, Religion). 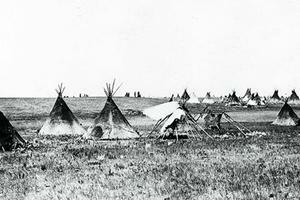 Assiniboine political and social structures are based on an extended family system consisting of nomadic camps, whose populations may have reached into the thousands. Generally, men held positions of leadership and made important decisions. A headman, or chief, was a "good man" chosen to deal with outsiders, but his actions were guided by a council with representation from each extended family group who came together to form a band, or nation, of people. Leadership was earned by superior hunting skills, through personal achievement in battle or attacks on an enemy, and by showing kindness and generosity to others. On special occasions special leaders were chosen, such as a war chief to lead in battle, a hunting chief for large-scale buffalo hunts, or as chief of the soldiers' lodge. People of recognized wisdom or talent were heard at council meetings where elders, medicine men, pipe carriers, women and heads of families met periodically to reach consensus on issues. Stretched across the prairies, over the centuries the different groups developed language variations, different histories and eventually formed autonomous groups in Manitoba, Saskatchewan, Alberta and the northern United States. Their image among European traders and settlers was generally positive, with frequent reports of their hospitality. Henry Kelsey first described encounters with the Assiniboine people in the 1690s. A young employee of the Hudson's Bay Company, Kelsey accompanied Assiniboine trading parties from the James Bay posts westward along the canoe route into present-day Saskatchewan, ensuring that fur pelts went to the Hudson's Bay Company in return for European trade goods such as metal utensils, firearms and gun powder, beads, cloth, tobacco, liquor and other manufactured goods. Later traders and explorers such as La Vérendrye and his sons (1730s), Anthony Henday (1754–55) and Alexander Henry the Younger (1800s) confirm the widespread location of the Assiniboine throughout the western prairies, and extending into North Dakota and Montana. Their way of life was recorded through the cultural perspective of these early travellers, who valued them for their economic contribution to the fur trade. As a result of this relationship with European traders, traditional Assiniboine trails became major travel routes to the south. Traditional campsites on the network of rivers flowing from the Rocky Mountains to Hudson Bay became fur trading posts and centres for the distribution of trade goods. Trading with the Hudson's Bay Company(HBC) from the late 17th century, Assiniboine people were noted for their pemmican production and their key role as intermediaries, trading European goods to more distant Plains peoples. The acquisition of horses several decades before Henday's arrival in present-day Alberta (1754), and their early access to guns and metal trade goods enhanced their role in the fur trade economy with both the HBC and later the North West Company. Their new wealth as traders, successful horsemen, respected warriors and as providers of fresh meat to the numerous trading posts reached a peak from the 1780s to the early 1800s. Through the 19th century they were closely allied with the Cree, while intermittently in conflict with the Blackfoot, the Gros Ventres and their Siouan relatives to the south. They suffered greatly from European diseases, especially smallpox. From an estimated population of more than 10,000 in the late 18th century, their numbers declined catastrophically to approximately 2,600 by 1890. In the 1870s, the federal government began to negotiate modern treaties between the Crown and First Nations. Promises of regular payments (ranging from $5 to $25), medical aid, education, and agricultural and economic assistance were made by treaty commissioners in return for the transfer of land and resources to non-Aboriginal settlers. With the near extinction of their main resource, the buffalo, in the 1880s, the Assiniboine people reluctantly submitted to living on reserve lands. In Canada, the White Bear and Carry the Kettle bands were signatories to Treaty 4 (1874), and the Mosquito-Grizzly Bear's Head bands were signatories to Treaty 6 (1876), while Assiniboine bands residing in the United States signed the Judith River Treaty (1855). The aftermath of such treaties were not favourable to Assiniboine peoples; many suffered from poor housing, deteriorating health, high unemployment, systemic discrimination, frequent abuse and cultural dislocation in residential schools, limited education and training, and government restrictions on religious ceremonies and political activity (see Social Conditions of Aboriginal People). The passing of a revised Indian Act in 1951 removed restrictions on religious ceremonies and political activity, and resulted in increasingly effective activism and community-led initiatives in Assiniboine communities. For example, to address the fraudulent seizure of land and forced integration into the White Bear First Nation by government officials in 1901, members of the Ocean Man and Pheasant Rump First Nations successfully petitioned to reinstate their respective band and reserve statuses in the 1980s and early 1990s. Today, Assiniboine First Nations exercise various degrees of self-government through elected band councils (comprised of a chief and councillors), but still within the constraints of the Indian Act, the Canadian Constitution of 1982, court decisions and under the guidance of the minister of Aboriginal Affairs. While many community-led initiatives in health care, education, daycare and resource development have seen success in Assiniboine communities, the Assiniboine language is nearly lost, with only approximately 150 speakers remaining. Though traditional Assiniboine territory extended across the prairies, Saskatchewan is the primary location for most Assiniboine reserves. Alberta has several reserves with significant Assiniboine populations — including those of their close relatives the Stoney-Nakoda — while Manitoba has none. 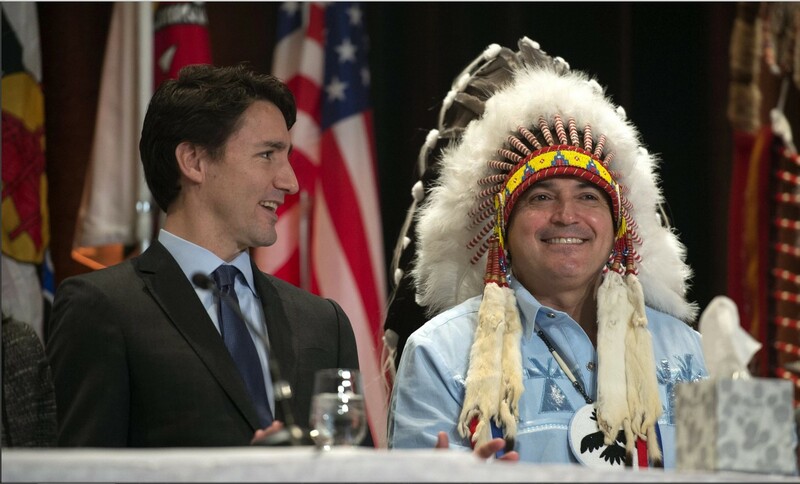 Additionally, Assiniboine people living off reserve may live anywhere in Canada, or indeed around the world. 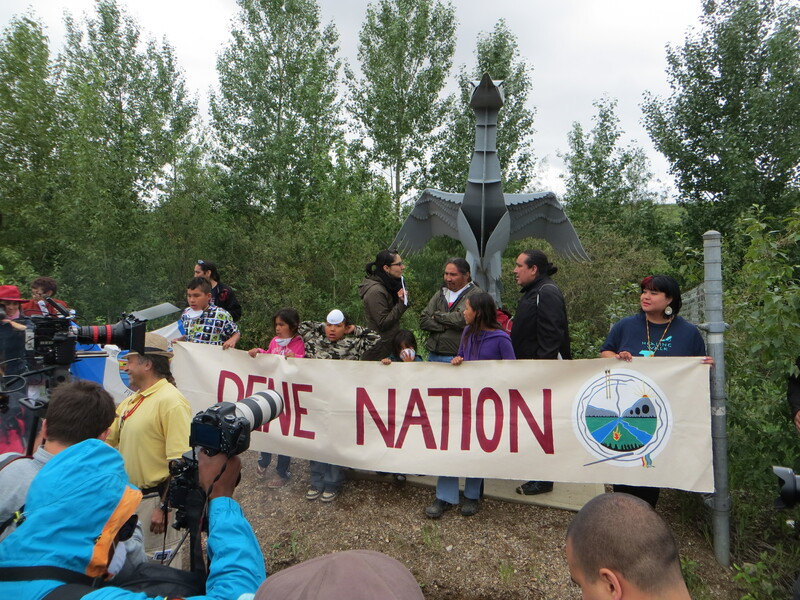 In Saskatchewan, the Carry the Kettle Nakota First Nation reserve is located 11 km south of Sintaluta (east of Regina), covering about 16,500 hectares of good agricultural land. In 2014, the band population was 2,714, with about 900 living on reserve and the remainder off reserve. The Mosquito-Grizzly Bear's Head Lean Man First Nations reserve is located about 27 km south of North Battleford comprising approximately 12,750 hectares of mixed agricultural land. In 2014, the band population numbered 1,324, with approximately 700 members living on reserve and the remainder off reserve. The White Bear First Nations reserve, shared with some Ojibwa, Cree and Dakota, is located 13 km north of Carlyle, comprising 17,192 hectares of farm land. In 2014, there were 2,579 band members, with about 900 living on reserve and the rest off reserve. The band benefits from community-owned oil and gas development, and recreational lands acquired under a treaty land entitlement. The Ocean Man First Nation reserve is located approximately 20 km northeast of Stoughton, with land holdings of 4512.1 hectares. In 2014, the total registered population was 500, with about 100 living on the Ocean Man reserve, and 50 more living on other reserves. The Pheasant’s Rump Nakota First Nation reserve is located 10 km north of Kisbey, and is comprised of 7,966.5 hectares of land. In 2014, the total registered population was 407, with approximately 150 living on reserve. In Alberta there are two Assiniboine-Stoney reserves located in Treaty 6 territory west of Edmonton. Paul Band #133 A, B and C encompasses over 7,300 hectares with a band population of over 2,000 (2014), of which over 1,200 live on reserve. Alexis Band #133 encompasses 6,175 hectares with a band population of over 1,800 (2014), of which over 1,000 live on reserve. See also Aboriginal People: Plains and general articles under Aboriginal People. J.L. Long, "The Assiniboines," in M. Kennedy, ed, From the Accounts of the Old Ones Told to First Boy (James Larpenteur Long) (1961); D.R. Miller, "The Assiniboine and Their Lands: The Framework of a Primordial Tie," Chicago Anthropology Exchange (1981); D. Rodnick, The Fort Belknap Assiniboine of Montana: A Study in Culture Change (1938); D.F. Symington, Hunters of the Plains: Assiniboine Indians (1972); E. Leigh Syms, The Important Role of the Assiniboine Nation in Manitoba's History (1991); D. Ward, The People: A Historical Guide to the First Nations of Alberta, Saskatchewan and Manitoba (1995).